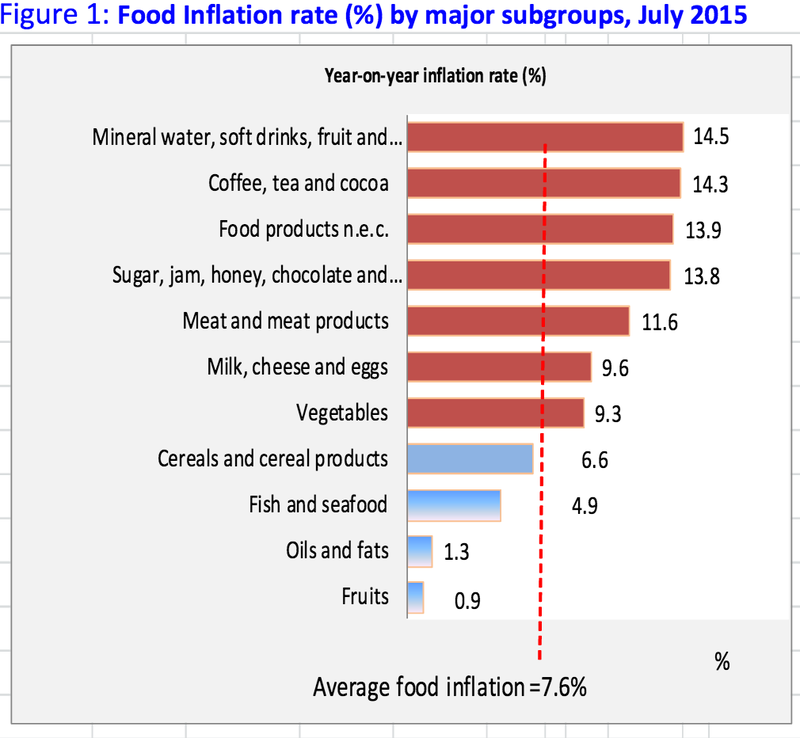 Ghana’s inflation has been on an upward trajectory since June, 2014. And this persistent rises of food inflation prices have generally attributed to currency depreciation caused by global commodity shocks to two of its biggest foreign currency earners, Gold and Oil. However according to a recent mid month report by Esoko.com, Africa’s leading farm data aggregator and syndication platform, Ghana food inflation prices seem to be in the process of a price correction. In my August Outlook Report, I touched on the fact that, considering the fact that Ghana front-loaded the IMF agreement, all things being equal, the worst is over and we should begin to start seeing glimmers of hope in the economy. Well I am here this morning to report one such incident that seems to have been largely ignored even though we haven’t seen such a positive economic incident in the Ghanaian economy for a while. According to Esoko, most commodities experienced price declines. The commodity with the highest decline was tomatoes losing 20 per cent to close the week at GH¢7.00 per “medium size tomato tin”. Some of the remaining commodities also experienced no change in price (which indicates that we might be bucking the trend). An olunka of maize prices remained stable in most markets across the country. It however dropped 12 per cent in Takoradi to close the week at GH¢5.70. The price for a bag of maize remained fairly stable in most markets this week. The wholesale prices remained the same. On the retail the prices for a kilo of maize lost 12 per cent to close the week at GH¢2.20 from a previous price of GH¢2.50. A “medium size tomato tin” full of fresh tomatoes dropped by 29 per cent in Bawku to close the week at GH¢9.00. In Tamale it dropped 33 per cent to close the week at GH¢6.30. Also in Dambai the commodity dropped 22 per cent to close the week at GH¢7.00 with Takoradi dropping 19 per cent to close at GH¢10.20. In Techiman the commodity dropped by 9 per cent to close the week at GH¢5.40 and Kumasi losing 7 percentage points to close the week at GH¢3.80. A crate of tomatoes dropped in price in most markets. In Bawku a crate of tomatoes was sold at GH¢160.00, decreasing by 6 per cent from last week’s price of GH¢179.00 with Kumasi in dropping 10 per cent to close the week at GH¢113.00. Takoradi and Techiman dropped by 11 and 15 per cent to close the week at GH¢267.00 and GH¢170.00 respectively. Tamale also dropped 26 percentage points to close the week at GH¢200.00 from a previous value of GH¢270.00. A kilo of tomatoes dropped by 29 per cent in Bawku to close the week at GH¢5.00. In Tamale it dropped 33 per cent to close the week at GH¢3.50 with Dambai dropping 22 per cent to close at GH¢3.90. In Takoradi, the commodity dropped 19 per cent to close the week at GH¢5.67 with Techiman dropping 9 per cent to close at GH¢3.00. Also in Kumasi the commodity dropped by 7 per cent to close the week at GH¢2.13. It had been expected that, with the rising fortunes of the local currency and the lowering prices of petroleum products, July would start the era of receding inflation. It seems that limited harvest due to lower rains have contributed to the rise in food inflation in July, and so while non-food inflation was rising, food inflation was also rising thereby causing a double inflationary episode in July. Another constraint was lower and unreliable rains during the year which resulted in the lower harvest the country was experiencing. While this rainfall pattern was good for fruits and vegetables, it was not conducive for the main staples such as maize, cassava, and yam. Another factor was the, the pass-through effect of a 15 percent transport fare increase in June and the base-drift effect in the month under review, compared with the same month last year, also contributed to the 0.8 percentage point rise in inflation. From a continental perspective, if we take some of the continents biggest economies and compare them to that of Ghana’s rate, we quickly realize that, Ghana’s food inflation is slightly lower than the going general African average 7.7 percent. In conclusion, I strongly believe that this marginal price improvement in food inflation is a sign of things to come considering the fact that Oil prices have been reduced a few times in the last few weeks, but Food prices have however failed to keep pace and self correct. As usual I will keep tracking developments in the Food Inflation segments and report back accordingly.